Last night, while I was cooking, and by cooking, I mean microwaving dinner, I was watching The Voice on TV. As I was watching it, I suddenly felt kinda sad that one of these two singers battling it out on stage had to lose. This triggered a conflicting inner monologue which eventually ended with, "That's just they way it has to be." Now, for a television show that I had never actually watched up until ten minutes ago, I was becoming far too emotionally attached to have even cared. And then, out of nowhere. I suddenly had a repressed memory flashback to when I was five years old. It was the annual "Fun Run." With the risk of sounding like I'm bragging, I am. 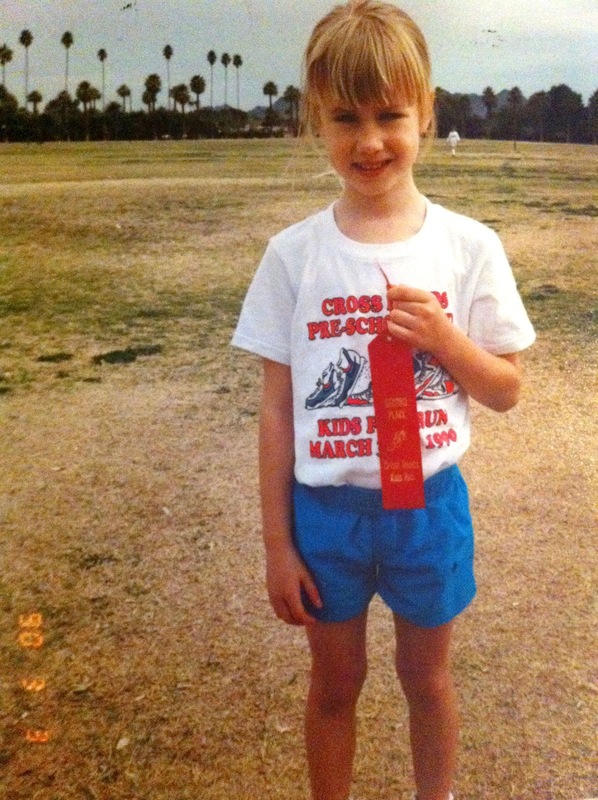 You see, I have always been a very fast runner. My whole life, people have likened me to that of a gazelle. My awkwardly long and gangly body, somehow displayed swift grace when all parts were moving synchronously forward. Now, if you're not familiar with track races, there are several different "heats." The winners of each heat then run in the final event to determine the overall winner. For my first race of the "Fun Run", I ran as fast as I could, and won. I caught my breath, as my Mom and Dad hugged and congratulated me, and then waited under the glaring sun for the final heat. When it was time, I stood up at the white chalked line, drawn on the dry grass. My body was engaged. My fists were clenched, my knees were in starting position. My heart felt as though it was already racing; I was nervous. With the words, "On your mark, get set, GO!" I leaped into the air instantaneously, as my legs quickly propelled me forward. There was no one in front of me. There was no one beside me. I was in the lead, and only a few steps away from the finish line when something suddenly came over me. I didn't want to win. I would feel bad if I won twice. Someone else should win, I thought. So, in an instant, my heart slowed down my legs. Just enough, to take second place. When the award ceremony rolled around, I regretfully watched first place collect her shiny gold trophy, as I received my red ribbon. I don't know why, but I've always remembered that. It's just one of those moments that stands out, in a distant childhood where memories blur together or simply fade away. For the first time in my life, I knew regret. I knew I let myself down. But it was a good lesson to learn at a young age because from then on, I've always tried my very best. Win. Or lose. The abilities we are born with are very special gifts. We should never punish ourselves for having them, or try to hide them. Rather, they should be celebrated. If you can sing, sing. If you can write, write. If you can swim, swim. And if you can run? Run like the wind child. awh this is so sweet. i feel the same way, though. i hate seeing people lose. i always tell my boyfriend how i even hate listening to ESPN talk about players who are doing poorly. I don't like when people try their hardest and don't come out on top! Love this. Such a great story! Aww, you did a kindness to another person by letting them win. Consider it a good deed & a lesson in regret= a draw. i love this and needed this today. thank you! What a great story to share. What a kind thing to do. I am sure you still have a big heart! I love to see people use their talents they have been blessed with. Love the Voice too! I want to pinterest your last little paragraph. I love it! I love the voice!!! The battle rounds make me sad too- I can't even imagine being one of the judges & having to choose between 2 amazing singers! You are a very sweet person to have done what you did- what a big heart you have! I remember the fun run days lol not so fun!! oh my gosh, i always get teary eyed when people lose (unless if they lose weight, haha, then i get teary eyed because i am happy for them) but that is a sweet story about your childhood! love it! this is sooo cute !!! Wait, I swear I'm tearing up! What a sweet post! this is an important lesson (: and i 110% agree. i too have the running thing down - running is my very rare graceful time, and have also been likened to a gazelle! tall skinny-ness came in handy. yay! Aw, you have always had such a caring heart! It is true though, God has given us talents to use, not to squander. Happy Wednesday! I totally thought I was the only one who hated when people lost! I always feel so bad. That being said, we all like to win! What a catch 22 uh? It was a great lesson learned though. You shouldn't let anyone take away what you rightfully earn. That was your talent and your race to win. Congrats anyways. As a recent runner, I wish I had your gazelle problem. But I'm working on it! "Our deepest fear is not that we are inadequate. Our deepest fear is that we are powerful beyond measure. It is our light, not our darkness, that most frightens us. We ask ourselves, who am I to be brilliant, gorgeous, talented, and fabulous? Actually, who are you not to be? You are a child of God." Very Cute story!I spent most of our track days letting everyone else win too, except I did it by not going to any of the races and eating freezies on the bleachers. This post was much needed for me- I really am thankful you wrote it. I have spent years hiding accomplishments instead of embracing them. I hate feeling guilty for succeeding when others don't. The opposite of a "one upper" I guess :) It is a lesson in not just BEING yourself, but loving yourself and being proud of yourself. Thank you for sharing! What a sweet post. PS - I love The Voice. this was such a sweet story and one line of this just really spoke right to my little heart today, and I just feel so thankful for checking in on your blog today! Ohh I love this. I was just talking about this very thing with my husband a couple of nights ago. It's nice to hear it from someone else. What a heart warming lil story! :) Always love reading your blog, you're a great writer -and- you always bring things into perspective. Hope you're having a great week gorgeous!